This is my first question on AskDifferent. I'm a photographer and have been using an external SSD to keep my Lightroom Library (develop and album metadata only, the picture files are on other devices). I usually have the SSD drive connected to a powered USB3 hub. I am on assignment in Tanzania and a couple of days ago there was a power outage and soon after a generator was turned on. During the short outage, the laptop switched to battery power, but the USB hub lost power. After power was restored, my laptop and other external drive that were connected at the time are fine, but this crucial external SSD is not mounting anymore. Disk Utility doesn't show either the disk or volume. Plugging in/out, rebooting or shutting down do nothing. It seems to me like the SSD is "(dead?)". Any idea if there is a way to "force-recognise" the drive in case it is still working? If not, could it be that a part of the drive "got fried"? If that is the case, is it possible to somehow send it in for repair/recover to salvage the data? Unfortunately I haven't done a backup of my catalog for about 2 months, so many hours of work on the pictures and albums would be lost. The volume is formatted as exFat (because I also use it with a video recorder that needs this formatting). If it still doesn't work, there's a good chance that your drive may be fine but the USB to SATA interface of the enclosure got fried. 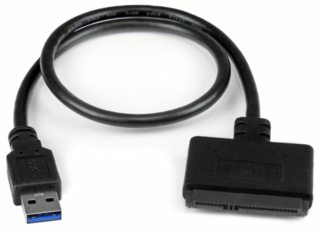 For a "quick and dirty" fix, get a USB to SATA adapter. I keep one of these handy for doing all sorts of diagnostic work exactly for exactly the scenario you are experiencing. This is basically a USB enclosure for your SSD without the "enclosure" part. You will just need to open up your existing enclosure and remove the drive. Don't worry about damaging the enclosure, right now it's dead and you're dead in the water if you can't get your data. Just be careful not to damage the drive or the drive's SATA/power connectors. Once you have the drive extracted and connected, you should be able to access it like you did before. Always make backups of your Lightroom catalog. If on assignment, do it daily. I am totally an amateur photographer and I back up my LR catalogs every time I open LR. You learned (unfortunately) the hard way about power surges. When that generator kicked on it probably sent a surge of current down the line. A backup generator doesn't provide the nice, clean power you've come to expect from the utility company. Get a quality surge protector (like APC) or better yet, get a battery backup (again, like APC) to sit between your outlet and your expensive equipment. It's much more cost effective to have a $100 UPS die than all your equipment and work. Not the answer you're looking for? Browse other questions tagged hard-drive usb disk-utility ssd restore .